Music fans and indeed all lovers of real fun and entertainment are in for a time of a life-time this Easter as Nigerian born worldclass turntablist, DJ Neptune has concluded plans to spoil them silly. The superstar Disc Jockey in partnership with world class event company, Gray Tiger Entertainment are set for a one-in-town concert titled, “Turn Up With DJ Neptune”. According to DJ Neptune, and Gray Tiger Entertainment which has been part of organizing several top events in the past including Nigerian Music Video Awards(NMVA), the event is a beach rave controlled by just one DJ throughout. 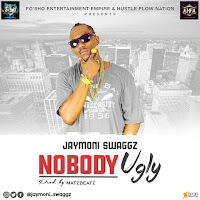 The event will witness performances from several artistes, both popular and upcoming ones and it will include electrifying dance performances, and give-aways. The show will be anchored by Dotun of Cool FM. 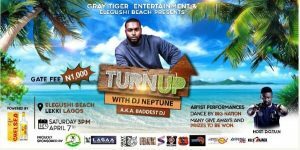 DJ Neptune and the CEO of Gray Tiger Entertainment, Izokpu Atagamen is inviting everyone including families to come party under the cool, fresh breeze of the sea in a strict, security tight atmosphere.